Recently, I started looking through the hundreds of photos I've taken over the years with my digital camera which are all stored neatly in files on my computer. It got me thinking - what's the point of capturing wonderful photos of family, friends, vacations, etc., when I'm just going to download them to computer files and then forget about them? It kind of makes me miss the "old fashioned" film cameras! At least then you were forced to actually develop the pictures! 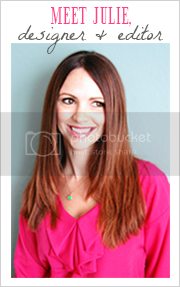 I'm sure many of you are guilty of this too, so I decided to write a "How To" post on creative ways to display photographs that are near and dear to your heart! 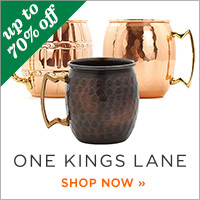 Pottery Barn had several great examples to help inspire you... This gouping of four frames hung on the wall above a small side table and large chair creates a cozy little space. I especially like that all the photos are black and white. 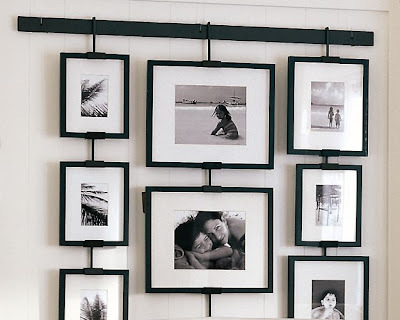 This is a fantastic way to create a unique photo gallery - layer frames of all different shapes, sizes and finishes and display them on wall ledge shelves. You can even mix in small accessories to give more texture and dimension. The small track of spotlights is a great way to light up your display. Another great example to showcase your photos along with a couple stacks of books and accessories. The white mats in the frames look great against the dark wall. Pottery Barn Modern Shelf. Studio Wall Easel - great for a more streamlined, clean look, these hanging wall easels would look great down a long hall way for the ultimate photo gallery. 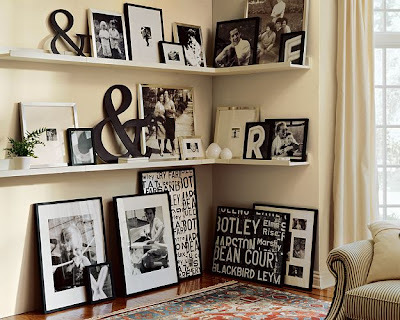 A great way to add interest to and otherwise boring corner in the family room. 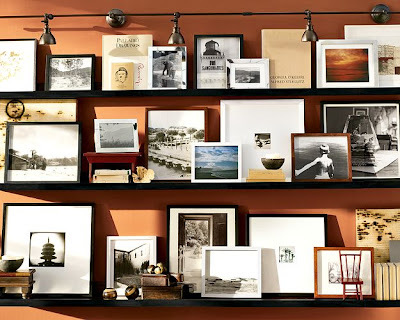 Lee Gallery Frames from Pottery Barn (available in different finishes).